A man who was convicted of drunk driving 13 times has been charged in a drunk driving crash that killed a 12-year-old girl in Sumpter Township. According to police, Charles Cahill was traveling at a high rate of speed around 8:20 p.m. Wednesday when he rear-ended a car with a family inside. A 12-year-old girl who was inside the car with the family was critically injured and airlifted to the hospital. She is was placed on life support, but was taken off of it last night. 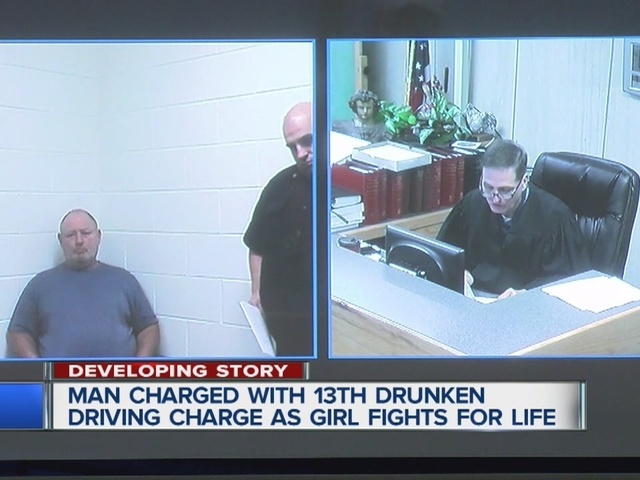 During Cahill's arraignment, the court learned he was driving on a suspended license and had an open container of alcohol in the passenger seat. Cahill has also been charged for domestic violence and assault. Two days before the crash, Cahill had a run in with police for a domestic issue. We're told he was drunk and put his girlfriend out on the street. He was held in jail on $1 million bond before his probable cause hearing on Aug. 10. Police have not yet said if they will be amending the charges.